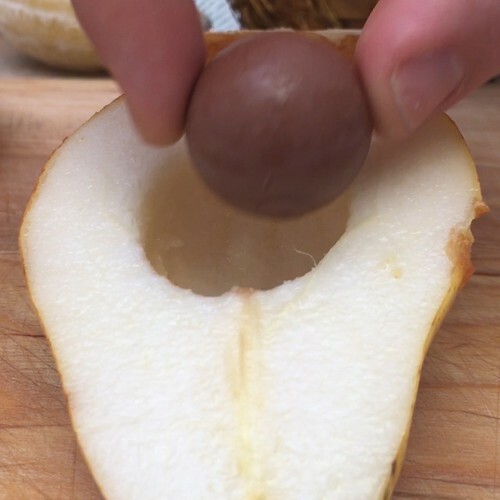 Cut the pears in half and remove the core from the middle, then place a chocolate lindt ball in each hole where the core was. Turn the pears over and place them on the puff pastry sheet. Cut around the pears with a knife, leaving a margin of around 1.5cm. Draw some leaves on the remaining pastry with a knife, then cut them out and add tehm to the tops of the pear pastry. Place the pears on a lined baking sheet and make vertical cuts into the fruit. Brush the fruit with lemon juice and dust with icing sugar. Brush the pastry with a beaten egg yolk. Bake the pears in the oven for 15 minutes at 180°C. Serve them fresh with whipped cream on the side.